1. Paint on a clear base coat, then paint the whole nail with two coats of the color of your choice (I picked black). 2. Once completely dry, take a paper-hole reinforcement sticker and cut it in half to make a moon shape. 3. Stick one above the center of each cuticle, then apply two coats of metallic-silver polish. 4. Once completely dry, peel off the sticker and apply a super-thin layer of topcoat to smooth the ridge where the colors meet. Voilà: You’ll find yourself feeling like a regular Daisy Buchanan. 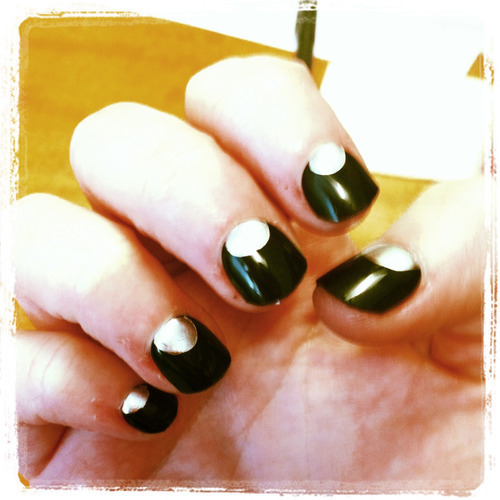 This entry was posted in Uncategorized and tagged great gatsby, madewell, nail art, sarah z. wexler. Bookmark the permalink.